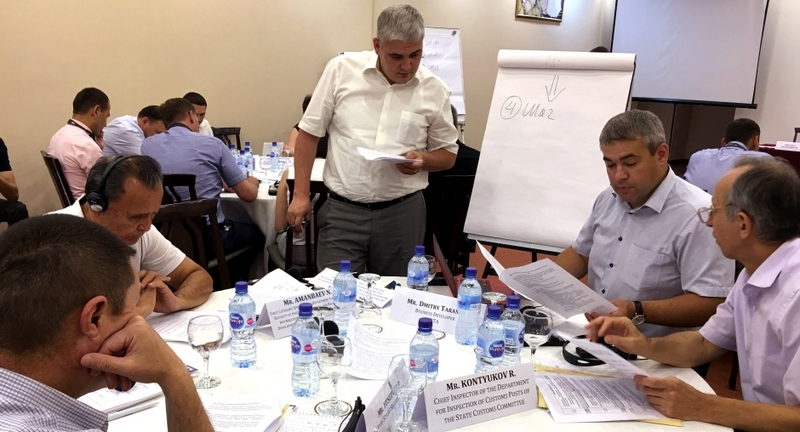 The Border Security and Management Unit (BSMU) of the OSCE’s Transnational Threats Department, in close co-operation with the OSCE Project Co-ordinator in Uzbekistan, organised a workshop on establishing an Advance Passenger Information (API) system in Uzbekistan from 13 to 14 June. The event was aimed at detecting and preventing the movement of foreign terrorist fighters (FTFs), particularly those returning or relocating from conflict zones. An API system is an electronic system through which biographic data from a traveller’s passport and flight details are collected by airlines. They are then transmitted to the relevant national authorities at the border before the departure or arrival of a specific flight. By checking the data against law enforcement watch lists, such as those of INTERPOL, border officials can know in advance whether FTFs or other passengers with suspicious profiles are attempting to enter their country. The event brought together 45 representatives from all the national agencies involved in passenger processing. They included the Head of the Aviation Security Department, police and customs officers, members of the State Security Service and the State Personalization Centre, as well as representatives from the INTERPOL National Central Bureau. The main purpose of the workshop was to draft a tailored action plan outlining the relevant technological and operational procedures for setting up an API system in Uzbekistan. The workshop was also attended by border control officers from Australia, Hungary and the United States, as well as commercial services providers and representatives from Uzbekistan Airways, who shared their experience in implementing and using API systems. The path to the establishment of an API system in Uzbekistan was paved by the adoption on 21 December 2017 of the Decision of the Cabinet of Ministers, which grants border and customs officers the authority to collect, store and process passenger data while fully respecting citizens’ right to privacy. The Decision sets 2020 as the deadline for the establishing of the API system in the country. The event in Uzbekistan was the eighth workshop on API that has been organized in the OSCE region since December 2016. TNTD/BSMU will conduct one more workshop in 2018, which will take place in Chișinău (Moldova) from 10 to 12 July.